Members of the EU Parliament (MEPs) receive about EUR 8000 per month as a salary, a budget of EUR 4300 per month for administrative costs, and an allowance for additional travel expenses and costs of EUR 304 per day of session. If there would be 200 days of session then the latter allowance amounts to EUR 60,800 per annum. The Dutch social democratic party PvdA (see the Brussels section) (footnote 1) is for efficiency, and thus has an internal rule for PvdA MEPs that 1/3 of the latter proceeds are pooled in the Anne Vondeling Foundation. The PvdA is also against abuse of public funds, and thus has the internal rule that the MEP who lives in Brussels or Strasbourg refunds another 1/3, unless there are shown expenses. It is not clear to me whether that 1/3 is returned to the EU or donated to the common pool of the AV Foundation, but that is immaterial to the following. The PvdA MEP leader Thijs Berman is in divorce and stays the nights in Brussels with his former assistant and new girlfriend. He has an official address in Paris so does not have to refund that 1/3. It is a bit curious that this other address is not in Holland where his constituents are. But we are discussing international politics that can put a severe strain upon the personal lives of the MEPs, and everyone can understand that it is better to retire in Paris than explain things in Holland. Dutch readers can check the VPRO interview by Tijn Sadee of November 14. Mr Sadee, not a sadist, is hesitant to discuss Bermans personal life but Berman agrees that this is unavoidable given the internal PvdA rules on restitution. Berman explains that his complex life causes EUR 2500 additional living expenses per month (apparently above of normally from his salary), thus to a total of EUR 30,000 per annum. Sadee suggests that this leaves still a surplus of another EUR 30,800, but neglects the donation to the AV Foundation. The actual surplus from the Paris address is only some EUR 10,000 per annum. There is also the subtle difference between the period up to 2012 and the current situation. When did the affair with the assistant start ? When did Berman move in with her ? This is not Vanity Fair but PvdA internal accounting. Unfortunately such details are not available in the PvdA reports and Sadee forgets to push the issue. The affair with the assistant seems to have put a strain on the PvdA MEP team. (footnote 2) Apparently they have been lacluster on the economic crisis, European unemployment and other priorities. Berman will not return as PvdA MEP leader though hopes to keep his seat. 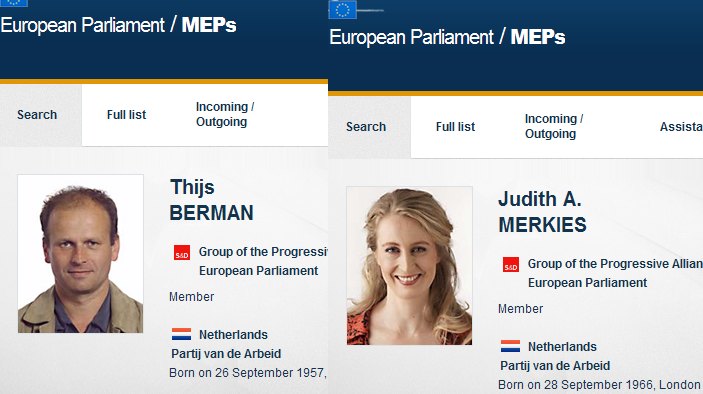 The PvdA chairman Hans Spekman has already discontinued PvdA MEP Judith Merkies. He accuses her of inability to work in the team with Berman plus being too slow in refunding the allowance. The first might be something to be proud of but the second is lethal in Holland where voters hate luxury cats at the EU Parliament. Merkies regards the latter as slanderous. In a rare move, she submitted PvdA chairman Hans Spekman’s accusation to the Amsterdam Judicial Court. A reputation of financial manipulation in Brussels might make it more difficult for her to find employment elsewhere. She lived in Brussels and was subject to the 1/3 + 1/3 refund rule. She waited till last Summer with the refund over the last four years. The committee that checked the finances provided this statement of October 15 2013 that she indeed paid her dues over the last four year at the end of July 2013. Thus she ought to be in the clear. Merkies claims that the internal rules were vague in particulars and that she had saved the money to pay when the rules had become sufficiently specific. See her statement in Dutch. This may well have been the case. One can imagine that Hans Spekman would have a hard time to explain “too slow”. In a surprise move, committee member Annemarie Mijnsbergen RA (registered accountant) withdrew from it, see this Dutch newspaper article November 15 2013. The article suggests that there is a new report of the committee but this might only concern some emails by the chairman of that committee, Hans Ouwerkerk. It turns out that this chairman of the committee had been corresponding with PvdA chairman Hans Spekman outside of the framework of the official report. This is improper and contrary to the final decision that Merkies was cleared by the committee. Thus a personal impression by the chairman of the committee over the grapevine has been guiding the viewpoint of the PvdA chairman, all behind Merkies’s back without the ability to reply. In another surprise, the Amsterdam judge ruled that politicians ought to accept more heat than others. The PvdA chairman was acquitted of slander. This is a sick ruling. It is true that there is more heat in political debate, but a chairperson or board of a political party has a different position than people in political debate in general. This chair and board exist for the very reason that they need to be very careful in its decisions and statements. This chair and board guide our selection of our MEPs. Thus they are subject to stricter criteria rather than looser criteria. It would seem that Ms Merkies is obliged to appeal to the higher court to defend herself and clean up this mess. For the anatomy of Holland, it is useful to know that Judith Merkies is daughter of econometrics professor A.H.Q.M. Merkies of VU Amsterdam and brother of SP Dutch parliamentarian Arnold Merkies. Professor of econometrics Harrie Verbon states that he follows the children of his teacher with interest – but perhaps also with support ? The committee that checked the finances consisted not only of Hans Ouwerkerk and Annemarie Mijnsbergen RA, but also (likely) of professor and senator Willem Witteveen, son of economist Johannes Witteveen chairman of the IMF. There is also Anne Dankert, who used to assist Berman but no longer does so. She is not that seductive assistant, though I don’t want to imply that she isn’t seductive. She might, but also might not, be related to famous MEP Piet Dankert. It remains a small world. I suppose that it is okay for the sons and daughters of the world to find their own way to decency, at least when they actually do so. There are some questions for law professor Witteveen to consider, also based upon the integrity of science. He ought not disclose matters internal to the committee but there are some materials and issues that have become public or ought to become public. (1) The committee website does not show the new report and the emails by Hans Ouwerkerk yet, that PvdA chair Hans Spekman presented in court. Please put them there or at another public place. (2) Mijnsbergen RA resigned in disgust. Why would professor Witteveen not do so ? (3) What does senator and law professor Witteveen think about the court view that politicians ought to accept more heat even from the own party board ? Should politicians not expect more care and less heat from their very own party board ? (4) Given the abuse of the committee, would it not be proper that a high level commission is formed to look into the case, with the option to clear Merkies for the EU Parliament candidacy again ? The PvdA congress is on February 15-16 2014. For the anatomy of Holland, it is useful to know that the PvdA has elected Paul Tang as the leading candidate for the EU Parliament elections of May 2014. Paul is an economist, had his thesis with Rick van der Ploeg, worked at the Central Planning Bureau (CPB) in 1995-2005 and was member of the Dutch Parliament in 2007-2010. During all this, Paul never asked questions about the censorship of economic science at CPB since 1990, which is the topic of this weblog (see the About page). Thus the new PvdA MEP team is off on a bad start in May 2014. For Dutch readers, there is this commentary on the verdict of the court of November 29 2013. A George Orwell Horror Show. 1) The PvdA dept. in Brussels actually passed a motion to support Merkies, see the Financieel Dagblad November 12 2013. This is the text. 2) Het Parool of June 24 2013, p. 8 reported that the assistant eventually was dismissed with severance pay. One supposes that the cost of this fell on the AV Foundation, that then could use the refund of Merkies.